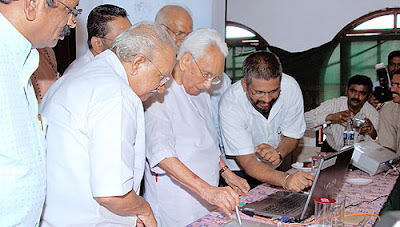 www.yesudasan.info, a website on the Life and Work of Cartoonist Yesudasan is being inaugurated by the former Chief Minister of Kerala Honorable Shri K Karunakaran on June 12, 2008 - 70th birthday of Yesudasan. The site prepared by Design & People was inaugurated at Bharat Hotel, Ernakulam. Hundreds of people from all walks of life participated in the event. About Yesudasan: Yesudasan was born on June 12, 1938 at Mavelikkara, Kerala in South India. His first cartoon appeared in 1955 in a magazine called 'Asoka' published from Kottayam. But it was only in 1960, he made an entry into the world of political cartooning, that too through 'Janayugam', the mouth-piece of the Communist Party in Kerala. In Janayugam he started a regular cartoon column with the character 'Kittumman', which became the first pocket cartoon in Malayalam. In 1963, he left for Delhi to join the Shankar's Weekly and became a disciple of cartoonist Shankar, the legend of Indian cartooning. On returning to his native place, he became the editor of 'Balayugam' and later started 'Asadhu', 'Cut-Cut', 'Tuk-Tuk' and 'Sadhu', popular satirical magazines on politics and cinema, in similar lines with Shankar's Weekly. In 1985, he joined the Malayala Manorama group of publications as a staff cartoonist. An excellent political satirist, Yesudasan has written three books - 'Aniyara', 'Pradhama Dhrusti' and 'Post Mortem'. And his latest book 'Varayile Nayanar', a collection of cartoons on the late Chief Minister of Kerala, Shri EK Nayanar was released by Dr Manmohan Singh, the Honourable Prime Minister of India. Yesudasan has also made a reputation as a script-writer for Malayalam films. He is the founder chairman of Kerala Cartoon Academy and twice the chairman of Kerala Lalithakala Akademi. An excellent political satirist, Yesudasan may be one of the few cartoonists in the country who handles the maximum number of columns a day - in both Malayalam and English. What I, as a caricaturist without choice, have felt dear about Yesudasan Sir is that his short frame refurbished by that curious and a fraction eyes and the never-panicky punctuated talk. However, those teeny weeny teeth below that curved nose often confuse me in doodling sessions. Few remember the spakling cartoon camps of the early 80s at Kothamanagalam, Kochi and Trivandrum where at least a dozen cartoonists of today in their 40s shone and were pampered by the seniors, to whom Yesudasan Sir remains a Guru, pleasurable to recollect. My best wishes, Sir ! How can a Malayala Manorama reader forget Cartoonist Yesudasan?